In today world PHP plays a vital role in website development. Using PHP you can send email to your users. You see in your inbox some mail come from noreply@domainname.com which type of mail can be create using PHP. You can send mail to many users using your own PHP mail function. Let’s come to know how to create PHP code to send Email. To clear understand of this post you should know PHP. For sending mail using PHP you need one html form so first create your html form. Here I give you Simple Html form which contains Name field, to mail id field, Message textbox and Submit button. Take a look at the below html code. 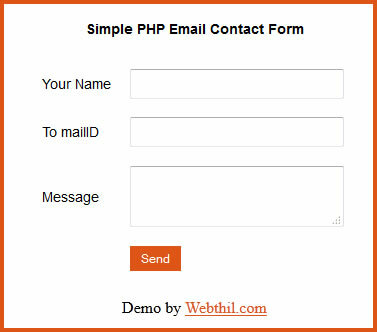 Already you create form in first step now you need to create PHP code for send mail. If you already know basics of PHP means it is so simple and easy to you. Here I give you simple PHP code. In this PHP script first I create three variables to store the data collected from the html form. After that I create script for sending mail. Please analyse the below PHP code. Here I didn’t use any validation if you need means you can validate it.